Michele Wallace is best known for her controversial, groundbreaking book, Black Macho and the Myth of the Superwoman. Published in 1979 when Wallace was twenty-six years old, it defined her as an outspoken feminist who was unafraid to examine the misogynistic elements of the Black Power and Civil Rights movements of the sixties, and explored how sexism as well as racism damaged the psyches of Black women. Not surprisingly, Wallace’s fearlessness came with a painful price. Although the book garnered her immediate fame and recognition in feminist and intellectual circles (so hot was the buzz about Macho that her face made the cover of Ms. shortly before the book was published), Wallace received an intense level of criticism from all sides that she was not prepared to face. 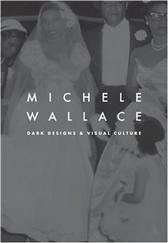 In her latest book, Dark Designs and Visual Culture, Wallace talks openly about how this criticism affected her personal life and health (she suffered a nervous breakdown a few years after Macho’s publication). A collection of articles, essays and interviews spanning over a decade, Dark Designs is also part autobiography. Alongside an extensive selection of personal photographs, Wallace candidly revisits the alienation she experienced as a misunderstood, young Black feminist and recounts the growth of her feminist sensibility. Although some of the essays attempt to say too much (I found “Angels in America, Paris is Burning, and Queer Theory” dull and endless, but wanted more of Wallace’s take on the imagery in films like Cheryl Dunye’s The Watermelon Woman), Dark Designs is an overall revealing, exciting gathering of Michele Wallace’s work over the years as one of this nation’s most daring cultural critics. Michele Wallace has been one of the early pioneers of black feminism. I feel no one will really ever know what went down between she and Gloria Watkins, a.k.a. bell hooks during that infamous 1995 Village Voice piece where Wallace ripped hooks to shreds. It sounded awfully personal. I wonder if those two ever patched up their differences. Great review of an important work.